Over the course of a weekend my team and I met with our client, Lucid Dog training, and from friday morning at 9:30am until sunday at 4:30pm we researched our audience, developed a creative brief, concepted multiple campaigns, and fleshed out an execution for a 2 credit intensive course at Portland State university. Five days later we presented to a group of panelists with current/past positions at Wieden + Kennedy, North, Crispin, Porter + Bogusky, and Sandstrom partners, among others. Our goal was to increase demand for their service in their target area of SW Portland without producing ideas requiring large time or financial commitments from Lucid Dog Training to execute the campaign. Our client came to us with the goal of increasing demand for their service in the SW Portland, Oregon area. Lucid Dog Training couples positive reinforcement style dog training with punishment when necessary, acknowledging that both have a place in building a positive dog-owner relationship. More than obedience, Lucid is focused on creating a lasting relationship between people and their pets. Lucid specified that they really didn't want to invest much time or money since they're already extremely busy actually training the dogs, but were open to suggestions involving both if the rationale was there. They have three types of dogs they serve: puppies, problem dogs, and adult dogs. Our account planners set out with some research goals, splitting half the team into primary and secondary research teams. Some of us researched the online landscape for dog training in Portland and sent out surveys, some went out to the streets to visit with dog owners and later talk to previous Lucid clients on the phone. Insight for puppy owners: People want “what’s best” for their new baby, but they don’t necessarily know what that means. What our puppy wants is to learn with us by playing with us. Insight for adult dog owners: The proverb “you can’t teach an old dog new tricks” encourages us to give up on our dogs. We have no idea what our old dogs are capable of. Insight for problem dog owners: Yes, my dog has problems, but underneath those problems is a beautiful dog. All that’s needed is the expertise to bring that out. When we were developing creative, we came up with over 20 possible concepts that would help Lucid gain demand for their service while spending less than $300 per month. With the help of Doug Lowell, the facilitating faculty member at Portland State, we eventually brought some of the best ideas together in one concept that we call: Ready. Set. Train. When we knew that our client needed a highly targeted, budget conscious approach, we new social was on the table from the start. Being able to highlight specific communities in the area, and the people within them interested in dogs and services related to dogs, was a huge attraction to the platform. We figured out our copy heavy concept actually worked really well in this media. 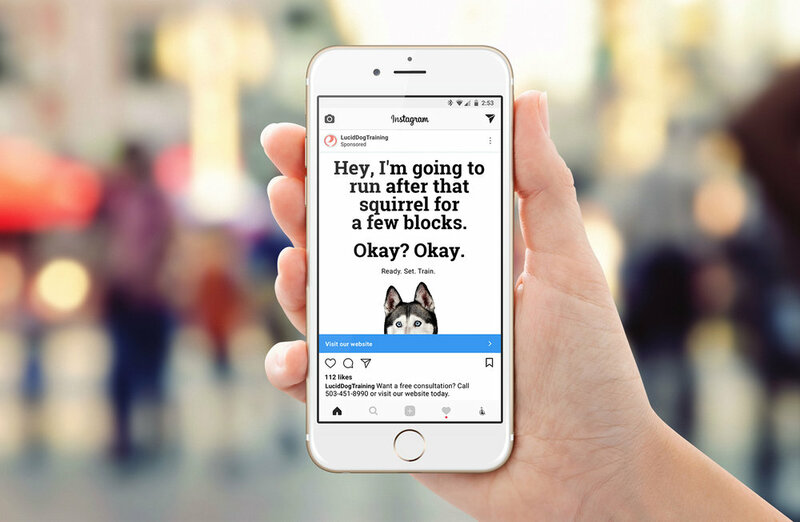 Through using large typography, matched to Lucid's brand standards, we could catch the eye of people scrolling through social media with trigger statements that anyone who's owned a dog for more than a week could relate to. Not only that, we were able to produce content for all three of our audiences. Once they were attracted by a problem that resonated with them, they see the image of the dog to know specifically that we're talking to them. Then the supporting taglines and LucidDogTraining lets them know that Lucid is the solution to this problem and any issues they're having with their lovable canine. Wrap that all up with the call to action to visit the website and set up a free consultation and you've got a machine to generate leads. Based on our research, the social aspect alone would generate 15 new clients per month, at a cost of only $30 per month. Currently, almost all of Lucid Dog Training's business comes from word-of-mouth referral via past clients or their relationships with various veterinarians, animal shelters, adoption facilities, etc. 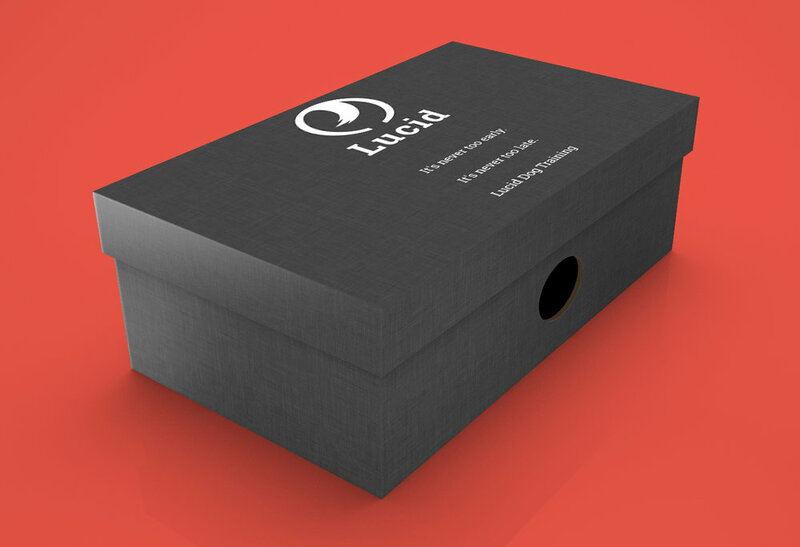 We wanted to enhance this aspect of their existing marketing strategy with cards that clients could print at home, or Lucid could print and provide to their existing partners. Lucid has always offered this free consultation, so we wanted to find a way to spread the word in a meaningful, and inexpensive, way. The estimated monthly cost for this portion of the campaign is less than $75. We set out to interact with our target audience at a place our research revealed people experience a lot of problems with their dogs: dog parks. Placing two of these metal doggy bag dispensers at parks in West Linn, Lake Oswego, and Hillsdale, Lucid could make a connection with people right as their experiencing the frustrations that simple training could resolve. Each of these boxes cost $38, and including the cost of 900 bags, this portion of the campaign costs $248.